Bright Side of the Road is an empowering book for anyone on a journey that has suddenly taken an unexpected turn. 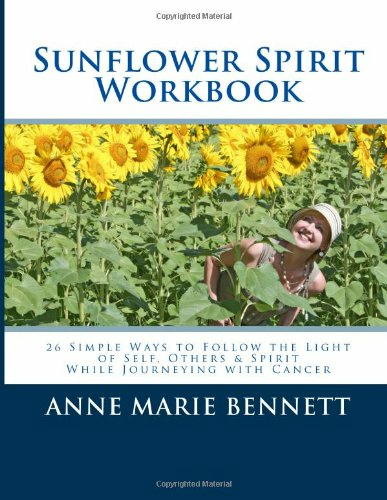 Created from Anne Marie’s journal entries during ten months of diagnosis, surgeries, chemotherapy and radiation treatments, her story will challenge and inspire you on your own journey towards healing. Hold her hand as she fully explores the difficult and complex emotions that exist at every stage of this journey. She bravely addresses themes such as: doctor-patient relationships, fear, communication, humor, anger,gratitude, patience, managing relationships, sexuality, expectations, self-nurturing, prayer, affirmations, and spiritual connection. My name is Anne Marie and I’m a 12-year Breast Cancer Survivor. I know you’re probably thinking, “What?! Is she crazy? There is no BRIGHT SIDE to breast cancer (or any other difficult thing that life throws at me). I’m scared. What I’m going through is awful. What could be good about it?” Well, I know exactly how you feel. When I was diagnosed with Stage 2 infiltrating ductal breast cancer in 2001, I was devastated, bewildered and frightened. Nor did I think I would headline the front page of any website with this particular Ralph Waldo Emerson quotation. Those days right after my diagnosis definitely did not seem like the best days of anybody’s year! Long before my breast cancer journey began, I read about people who believed that being diagnosed with a life-threatening illness was the most important, life-giving thing that had ever happened to them. I read about these people from the safety of my own little world, my cancer-free world, and I could hardly believe they could possibly be serious. It seemed to me that these people were not in touch with reality, that their cockeyed optimism was just a mask to hide their real feelings and experience. Now, much to my surprise, I find that I am one of “those people.” Soon after my diagnosis, I realized that I had a choice to make about how I would deal with this life-threatening illness. I could let the cancer bring me down, close me off, scare me into smallness. Or I could sanction its presence in my life, embrace the flow of never-ending changes, and allow it to transform me. My book, Bright Side of the Road, is about that choice I made… which turned into a stream of choices that flowed into a new way to live my life. Was it all sweet-smelling roses and laughter? Definitely not! There was plenty of anger and doubt and insecurity and grumpiness (just ask my husband, Jeff!). But I allowed that to be part of my journey as well. I decided to write this book for many reasons, but mainly because of you. You have found this site because your life has been touched by breast cancer in some way. Maybe you’ve just received the diagnosis. Perhaps you love someone who is struggling through treatments. Maybe you have already completed your treatments and are wondering what is next for you. Or maybe you are simply curious about what women with breast cancer go through. We all share a unique connection because breast cancer has swooped down and interrupted our lives in some way. Because of this, we are deeply connected even though we have never met, even though we may never meet. I would love to walk with you on your own spiritual journey through breast cancer (or any other difficult thing you’re going through). This book is amazing because I am able to be totally present with Anne’s journey: the pain and joy, humor and frustration, the anxiety and the glory. It is a special gift she offers in these pages. This will be vital information and companionship for those immediately on a journey with cancer as well as those who minister to, support and accompany them. Anne’s voice is trustworthy and intimate, so that one never feels dissonance or disorientation. Her voice is sure. Reading Bright Side of the Road was like being inside the mind and body of every one of my breast cancer patients. I finally understand now what the experience is like from the patient’s point of view. This book is captivating and engaging. Anne Marie has a tone and style that supports, inspires, and educates.